The title of “work in progress” at South by Southwest is a dubious one at best. Last year, the Seth Rogen and Zac Ephron comedy “Neighbors” played to a packed Paramount Theater months ahead of its seemingly identical release print a few weeks later. A few SXSWs earlier, Paul Feig’s “Bridesmaids” played with the similar “work in progress” label that had yet to finish sound mixing, meaning it was the same version audiences watched in theaters a few weeks later. “Trainwreck” is the latest “work in progress” to play to SXSW audiences. Whatever version I saw last night was brilliantly made, smartly written and hilarious. If it is indeed a “work in progress,” please don’t change a thing. Star and writer of “Trainwreck,” Amy Schumer, creates a flawed assertive character to tear up the New York romantic comedy tropes. She goes as far as re-appropriating Woody Allen’s iconic bridge shot from “Manhattan” for a bawdy laugh. Schumer’s character, also named Amy, learns from her father at an early age that monogamy and true love are fantasies. An all grown-up Amy, now a magazine writer in Manhattan, is highly relationship adverse and unapologetic for playing the field. An unlikely assignment sets her up with a charming sports doctor (Bill Hader), and soon Amy is disregarding her disenchantment with love for a chance to date someone she genuinely likes. Other than the disregard of journalist ethics and sleeping with your subject, “Trainwreck” is about the simple affectionate faux pas and the clash of different points of view in relationships. Yes, Schumer riffs on the expected male trait of never wanting to settle down, but it never feels like it’s a gender reversal shtick. Hader’s character does not come across as more feminized because he hasn’t had as many partners as his girlfriend. Nor does Amy come across as desperate for a romantic partner; she’s comfortable with or without a relationship. Director Judd Apatow and Schumer seemed to have a great working relationship as the pair traded jokes on-stage at the post-movie Q&A. 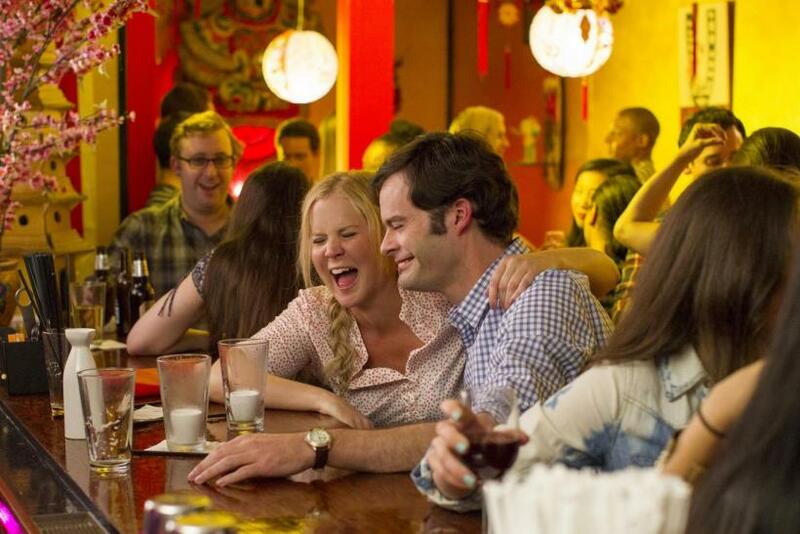 Schumer’s voice is not only apparent in “Trainwreck,” it’s unmistakable. A few of her popular routines from her stand-up made their way into “Trainwreck,” including the Connecticut party where Amy disturbs her sister’s friends with a ribald joke. In some of the film’s darker moments, Schumer wrote in some of the struggles she endured with her father’s MS illness. The Apatow-Schumer collaboration feels so seamless, I almost assumed Schumer was behind the camera at times. Schumer’s confidence in this movie and her stand-up is infectious. Not everyone has strong, unapologetic women in their lives, unconcerned about their flaws and your perception of them. Schumer’s irreverent writing is sharp, and sorely needed in the landscape of witless bro comedies like “Hot Tub Time Machine 2.” Can we turn Amy Schumer into the next Hollywood franchise? We need more smart and funny women on screens big and small. “Trainwreck” opens in theaters July 17. SXSW runs March 13-21. To follow the rest of my SXSW coverage, follow me on Twitter @mcastimovies.